In Ishikawa Prefecture on Aug 2, a 58-year-old man visited the Kanazawa Arimatsu branch of fast-food giant McDonald’s for breakfast and ordered a Sausage Egg McMuffin. However, upon biting into the meat patty he noticed some unusual white fragments. After examining the tooth-looking pieces measuring about seven millimeters in length the man showed them to the staff who were also unsure of what they were. Nevertheless, they submitted them for analysis and filed a report with the local health inspector on Aug 3. The following day, McDonald’s Japan issued an official apology to the customer and promised to both give him a full refund and determine what those things were within a month. Following that they will launch an investigation into where along the supply chain the foreign matter might have made its way into their food. With regards to Sausage Egg McMuffins, the meat is processed and imported from the USA while the buns are produced in Japan. For such a large company, McDonald’s Japan might seem unusually but refreshingly forthcoming with an admission of fault and transparency on what’s being done. The reason for this is a spate of incidents involving foreign objects in food beginning in 2013 that ultimately resulted in an unprecedented loss of revenue. The incidents themselves and ensuing lack of satisfactory apologies – which Japanese people take very seriously – nearly brought the massive company to its knees as Japanese customers walked away in large numbers. Those white chunks pictured above look an awful lot like cartilage. McDonald’s is probably assuming the same thing, but are playing the situation as safe as possible and following the “foreign matter” playbook word for word, to avoid another calamity. It will take some time for the test results to confirm what this stuff is, but it will be interesting to see how this plays out. 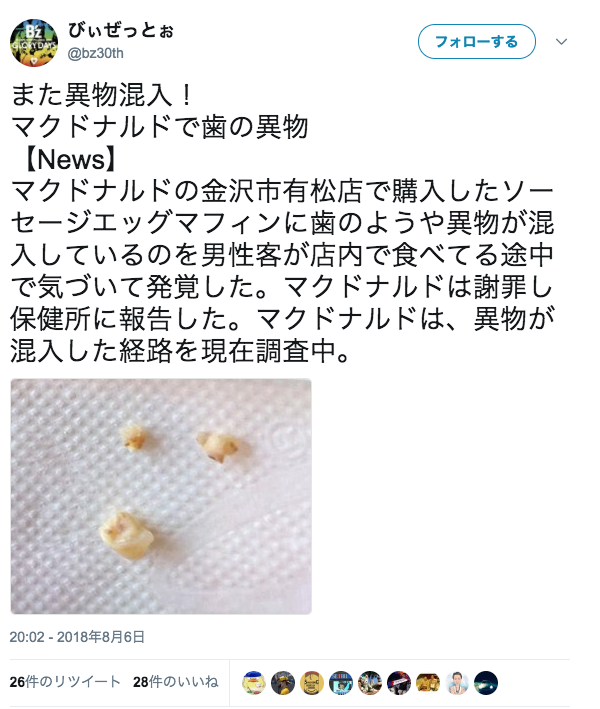 In the most likely event that these are just chunks of chewy cartilage, we may be in store for a really awkward press conference where McDonald’s Japan has to offer a sincere apology for having a little too much gristle in their sausage, complete with full bowing and all the trimmings. The breakfast sandwich that bites you back. I'm lovin' it! Realistically, the whole thing is "foreign matter" because McDonalds IS NOT FOOD! No way those tooth "nuggets" survived the grinding process so it's somewhere after that. I'd check the cook for a missing tooth first. It is food. It may not be food to your liking, or even all that fresh. But it's food. I don't know about you, but many people I know who slam McDonald's will happily go out and eat at a 100 yen izakaya, buy a dish from some yakuza-run stall at a matsuri, or dine at some other cheap joint like Saizeria. While the media watches McDonald's for every misstep, nobody checks these places out. You can be pretty sure that when they source their food, they source entirely on price. I would trust McDonald's food over almost any other low-priced eatery, simply because they are watched and they have to work hard to protect their reputation. A few times, while eating meat, I've found tooth parts exactly like the ones in the picture. In each case, it was from my own tooth breaking. They should get a dentist to examine his teeth. Too bad that the fragments weren’t found in Chicken McNuggets. Had that been the case, it might have put to rest the expression “scarce as hens’ teeth”.